Happy weekend everybody. Featuring SHYLA, a very special buy for the weekend. 16mm polymer clay pillows on a vanilla base with shades of pink and green flowers. Topping the pillows are rondells and brios in the same colour palette. 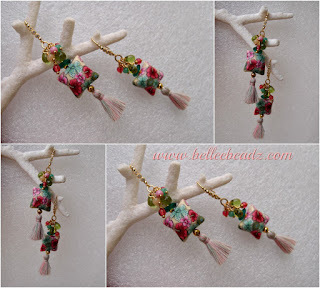 Petite tassels - 2cm long - in the same colour theme add a happy ending to this pair which drops at slightly over 7cm.